Now Lenovo A7000 has been get the latest update firmware to Android marshmallow 6.0. The latest update was shown at june 17, 2016. The build number version of latest firmware is A7000-a_S225_160517_ROW. This update goes to fix bugs and increase performance of the device system. As long as I try this device with android 6.0 in some days with normal usage and default setting. I was found a problem the battery consumption wasteful. In one days I could recharge the battery three times. even I just used two messenger application whatsapp and BBM, only a games Clash of clans, browsing with google chrome and operamini. Quoted from various source evidently this problem caused by an application running on the background. It is auto start application and running on the background automatically. It can do connect to the internet and do synchronizing. Actually Google in Android 6.0 has already preparing the feature to disable or restriction auto start application on the background. Go to setting – power Manager – background App Management. 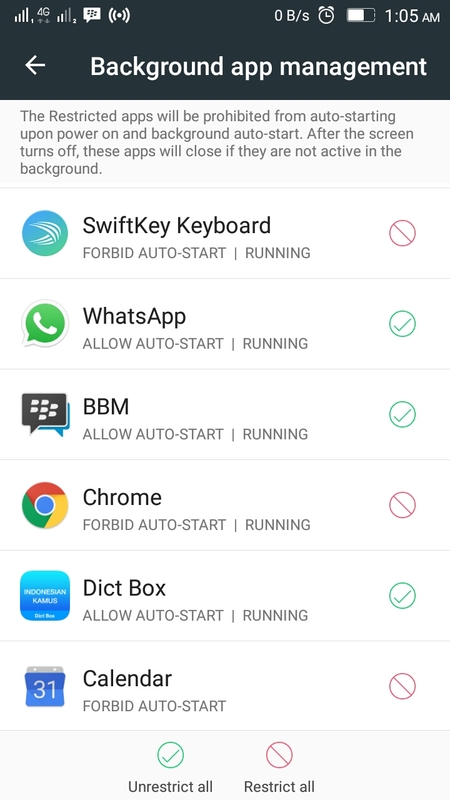 Choose restrict all application if you want to disable auto start. For recommend the messenger application like whatsapp and BBM no need to restriction. Because They are important and needs connect to the internet for receive message syncronice data. We can also activate battery saver feature. 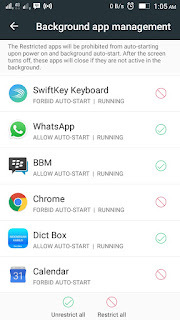 This feature will disable all activities the application. All application would not connect to the internet even though the internet data setting is switch ON. But if we Run an application. It would back normally.